Pug Dental Care is a very important area of your dog's overall health. 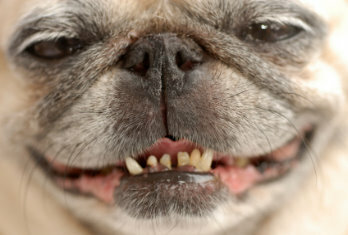 Pug dental care is an often overlooked area for a healthy dog. Do you see that adorable little head? Your little Pug has no less than 42 permanent teeth inside his mouth. That many teeth in such a little mouth can lead to problems. Almost all brachycephalic breeds (flat-faced) have a problem with over-crowded teeth. With that many teeth so close together it’s easy to have plaque build-up very quickly. We all know that this is not a healthy condition in humans so it should come as no surprise that it isn’t good for your Pug either. It can lead to an inflammation of the gums which is called gingivitis. If you do not take care of your Pug’s teeth on a regular basis this inflammation can lead to periodontal disease and, eventually, can result in the loss of teeth. If you think back to your own trips to the dentist you were probably told that a problem like gum disease can lead to far more serious conditions. Many dentists have posters on the wall warning you of the dangers of gingivitis and gum disease and advising you to brush your teeth carefully every day. The same thing can happen to your Pug. Gum disease can lead to bacteria making its way into the bloodstream and can affect your dog’s heart, liver and kidneys. It can actually result in a disease in any of those organs. How do you prevent such a condition in your Pug? The same way you do for yourself – Pug dental care is remarkably similar to the care that you take to protect your own teeth. Brushing your dog’s teeth on a regular basis is the best way to avoid some serious dental problems in the future. But don’t use the same tooth brush as you would use for yourself and definitely DO NOT use toothpaste designed for humans. There are tooth brushes specially designed for dogs and, for a Pug, the smallest ones you can find work best. Some of them have bristles on both ends and they make ones that fit over your finger as well. Use what is most comfortable for you and your Pug. Start by letting your Pug taste the tooth paste by licking it off your finger and then off the brush. Gradually introduce the brushing process by starting with the front teeth. After a while work your way around to the back. Ideally you’ll want to brush your dog’s teeth every day just like your own. Two to three times a week is the absolute minimum. What happens if you just can’t do it? Maybe you’ve started late or maybe your Pug just absolutely refuses to open his mouth whenever the toothbrush comes out. What do you do then? They make rinses with a nozzle that can be squirted into your Pug’s mouth. These are definitely not as effective as brushing but may be your only course of action. If you can do both, brushing and rinsing, you’ll be helping your Pug to maintain a healthy mouth. Your veterinarian should be able to provide a professional cleaning for your Pug or be able to direct you to a place that will provide that service. Pug dental care is really a part of good veterinarian care. It’s not a bad idea to do this once a year. It’s especially wise to do if your Pug is getting bad breath or cracking or losing teeth because this could be a sign that a more serious condition is starting to settle in. Pug dental care can also be supplemented through approved chew toys that can help keep your Pug’s teeth and gums healthy. These are probably the easiest thing to work into your dog’s routine. It’s a good idea to watch your Pug as he starts to chew on the toy. For safety’s sake you should supervise your Pug when he has any chew toy. As it is with humans, proper Pug dental care is often overlooked as a part of healthy regime for your dog. Remember that gum disease can lead to far more serious conditions so it is well worth the time, effort and expense to keep your Pug healthy through good oral hygiene.